From the scenic curves of Highway 191 in Gallatin Canyon, one might never guess that a luxurious experience waits behind an unassuming log and river-rock lodge near Big Sky. The restaurant is a place that locals know, but one that visitors often miss. The Rainbow Ranch Lodge has 100 years of history but, unless they’ve heard of it, it can easily get passed by in a flash on the way to Yellowstone or up to Big Sky Resort. 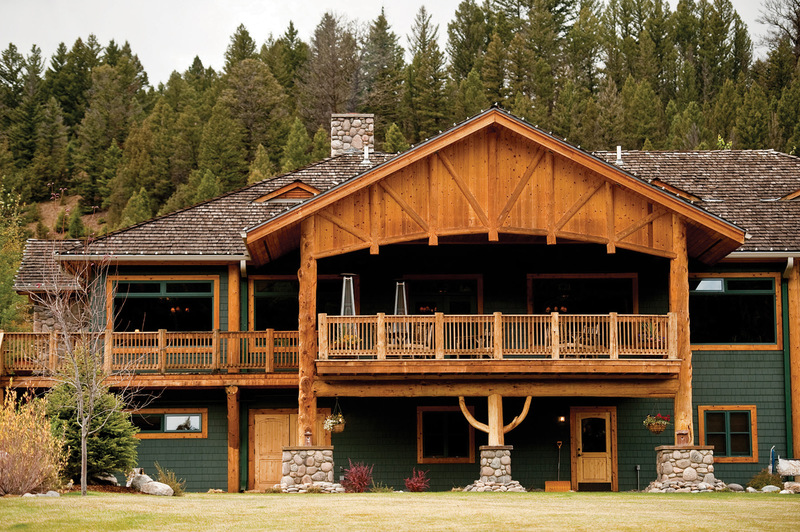 Yet through the double doors of the Rainbow Ranch is a slice of Montana that’s worth seeking out. 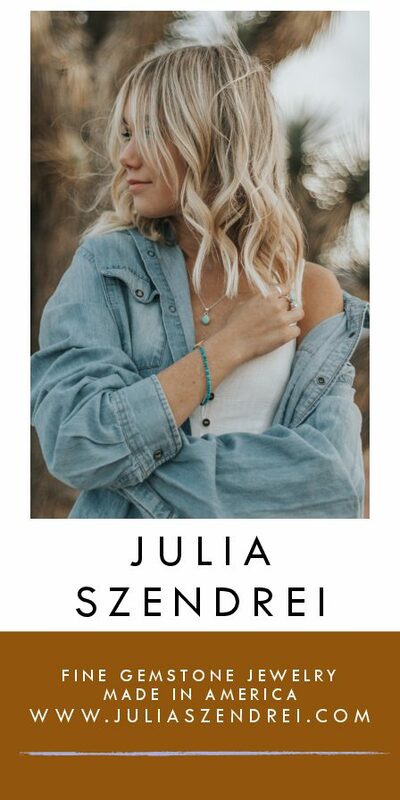 It’s a place with a warm embrace inspired by the coziness of log cabins, days spent on the river, and the hominess of wood smoke from the fire. The lounge and restaurant welcome visitors with a long span of windows that overlook a sweeping green lawn and the Gallatin River. The cozy atmosphere shouldn’t be mistaken for folksy when it comes to the food, however. Dinner at the Rainbow Ranch is a delicious and sophisticated excursion into what head chef Hunter Durgan calls ranch-to-table cuisine. Guests may come to the Rainbow Ranch for the riverside rooms and its location halfway between Bozeman and West Yellowstone, but it’s the food that really punctuates the place. Durgan is the kind of chef who considers food with all his senses. In the summer months, his menus turn light, with accents of fresh ingredients such as local frisée and bright sauces. In autumn, he might incorporate the tang of ripe, red currants. Winter months bring the sultry flavors of braised short ribs with a rich demi-glacé rendered over the course of three days. Spring opens up colors and flavors again, from accents of reduced carrot juice to the height of oyster season on both coasts. The dining room at the ranch is intimate, which allows him the luxury of planning menus that respond to the ingredients that are in season. 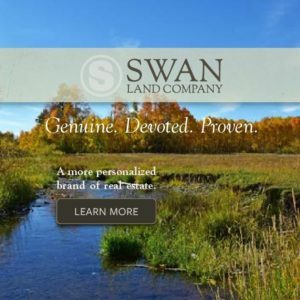 His approach to cooking translates to dishes with the classic ingredients one would expect from a Montana lodge — rainbow trout, wild game, bison, and beef steaks — but with a finesse inspired by classical French techniques. There are layers of unforgettable flavors, some of which come from the cherry-wood grill, but perhaps more from Durgan’s inclination to combine bold flavors and let them shine. The destination aspect of the Rainbow Ranch defines the menu, too, offering up rich and unusual ingredients, from trout caviar to wild boar chops. An impressive wine list, compiled by general manager and sommelier Ryan Kunz, highlights the cuisine with a range of vintages from French Burgundies to Pacific Northwest pinot noirs. 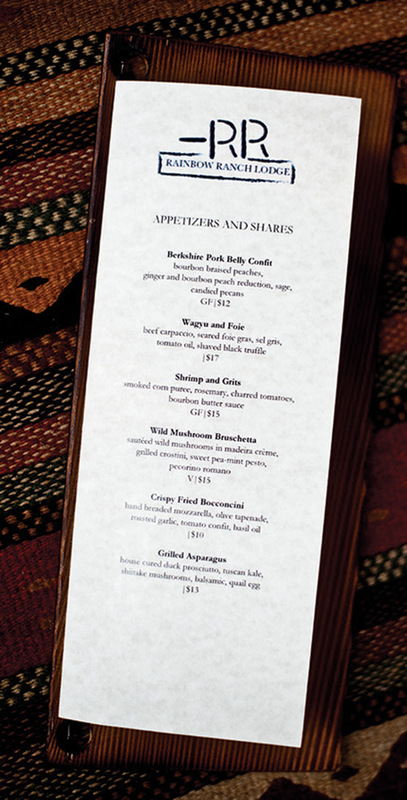 A bar menu with smaller plates matches the artisanal cocktails and Montana microbrews. Dinner in the main dining room is an honest commitment, one to savor and experience at a leisurely pace. When the restaurant is at its busiest, Durgan likes his kitchen to hum with purpose. The music is generally off, the grill is fired for fast, hot cooking, the line is prepped for service, and the door between the kitchen and dining room is shut. “I like to keep the extraneous noise out so that we can all focus on the task at hand,” he explains. He credits that approach to his culinary mentor, Andy Blanton of Cafe Kandahar in Whitefish, Montana. The James Beard Award-winning chef imparted a philosophy of “thoughtfully constructed cuisine” during Durgan’s three years as a sous chef at Blanton’s restaurant. 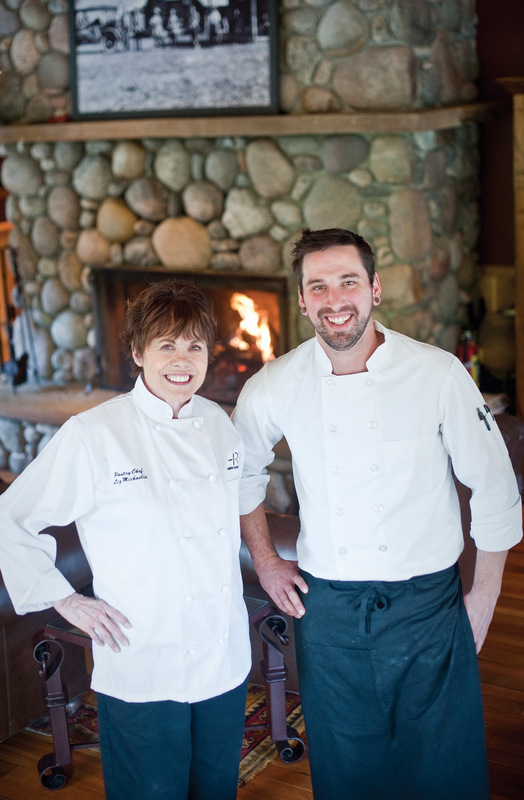 Durgan works closely with Rainbow Ranch pastry chef Liz Michaelis, emphasizing that teamwork in the kitchen is essential to success. He relies on Michaelis’ professional culinary training and expertise to elevate the last course of every meal. And Michaelis makes that effort seem easy. “I became a pastry chef because it’s something that makes people happy,” she says. Her passion for pastry shows with delectably complex desserts, but the premise behind each is simple. She states it clearly when she says, “I think chocolate is for sharing.” That results in the Rainbow Ranch’s signature dessert, the Coeur de Bretagne. It’s a chocolate bomb that’s ubiquitous in French pâtisseries, featuring two kinds of chocolate mousse inside a dark chocolate glaze. But Michaelis creates another level of decadence with the addition of a sea salt caramel layer and an accent of hazelnuts to balance the sweet saturation of all that chocolate. Spooning a bite from this ultimate chocolate-lover’s dessert is half the experience, as it reveals an architectural feat of culinary skill. Dark chocolate, milk chocolate mousse, and caramel layers are distinctly gradated by color and flavor. Combining Michaelis’ passion with Durgan’s focus, the restaurant at the Rainbow Ranch is a foodie must for anyone in Montana. The location is highly sought after as a wedding destination, partly thanks to this culinary team. During the busiest months of summer, their relatively small staff can crank out a wedding reception for 200 people on the front lawn, a barbecue for 60 in the barn, and 100 highly crafted dinners in the main restaurant. 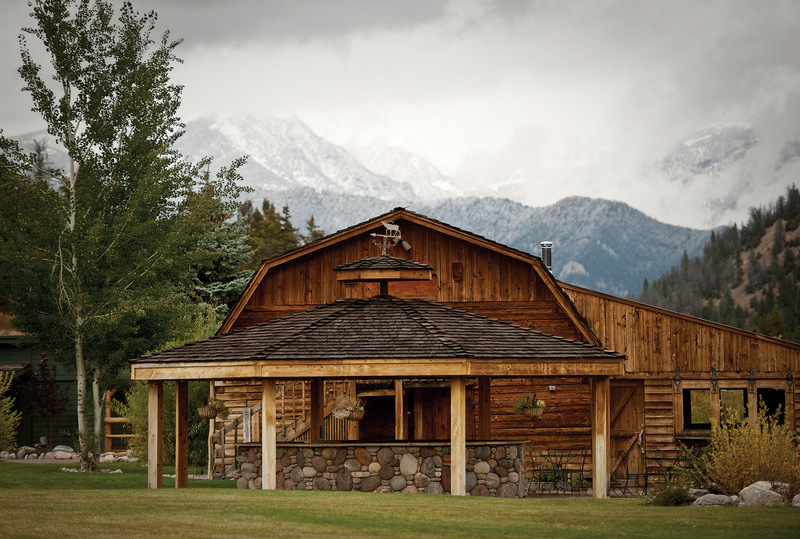 The Rainbow Ranch is also known for special event dinners that highlight wine makers and craft beer brewers around the Big Sky community. Slow down, don’t miss it. Cut boar or pork racks into individual portions, three to five bones each, depending on size. Next, in a food processor, combine hazelnuts and breadcrumbs and puree until uniform in size and not clumped. If the mixture clumps, add more breadcrumbs to offset the moisture of the hazelnuts. Season boar or pork on all sides with kosher salt and black pepper; place fat side down on a grill over medium heat. Sear on all sides, taking care not to burn the bones, as they will break if they get too hot. Meanwhile, in a small bowl, combine mustard and honey. Mix with a fork until uniform. (Mixture will seem too thick to brush — that’s OK. Don’t add water.) Once the meat is nicely caramelized, remove from grill. Use a basting brush to spread the honey mixture evenly over each piece. After the meat is coated in honey, dredge it in the hazelnut and breadcrumb mixture and place bone side down on a sheet pan. Finish cooking in oven at 450 degrees until an instant-read thermometer reaches 130 to 140 degrees, or to your desired doneness. Rub the flesh side of the squash generously with oil and place skin side up on a sheet pan. Bake at 350 degrees until squash yields easily to pressure. Warm cream on the stove, just until it’s hot, no need to boil. After the squash has cooled slightly, scoop the flesh into a food processor and puree, adding cream as needed until the mixture is smooth. Season to taste with salt and pepper. In a heavy-bottomed skillet, sweat shallots in olive oil until translucent. Add currants, vanilla bean, and sugar, and season lightly with salt and pepper. Keep your pan moving to prevent the berries from sticking. As they cook, the berries will release moisture and you’ll develop a good amount of liquid in the pan. Allow this liquid to reduce on medium-high heat until it becomes a thick syrup, stirring occasionally to prevent the sugars from burning in the pan. Once your liquid has reduced, add your brandy (be careful, it’ll flame up on you), then reduce again to cook out the alcohol. Reduce your heat to a low simmer and add your demi-glacé. Simmer the sauce until it reaches nappe consistency, thick enough to coat a metal spoon without running. At this point, if desired, you can whisk in your butter to add a richer flavor, keeping the heat low, or simply enjoy! Pastry Chef Liz Michaelis and Executive Chef Hunter Durgan team up with a menu that combines exceptional regional ingredients with French-inspired techniques. 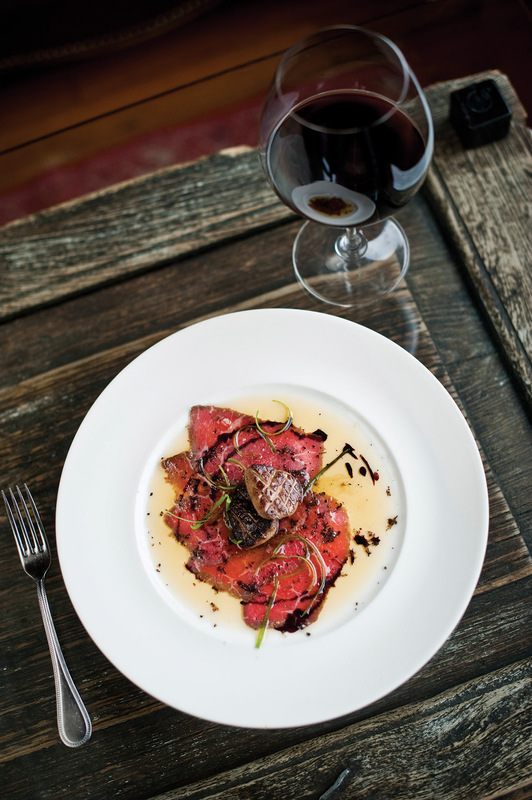 An appetizer of Montana wagyu beef carpaccio and seared foie gras with tomato oil and shaved black truffle reflects the Rainbow Ranch Lodge’s approach to ranch-to-table cuisine. 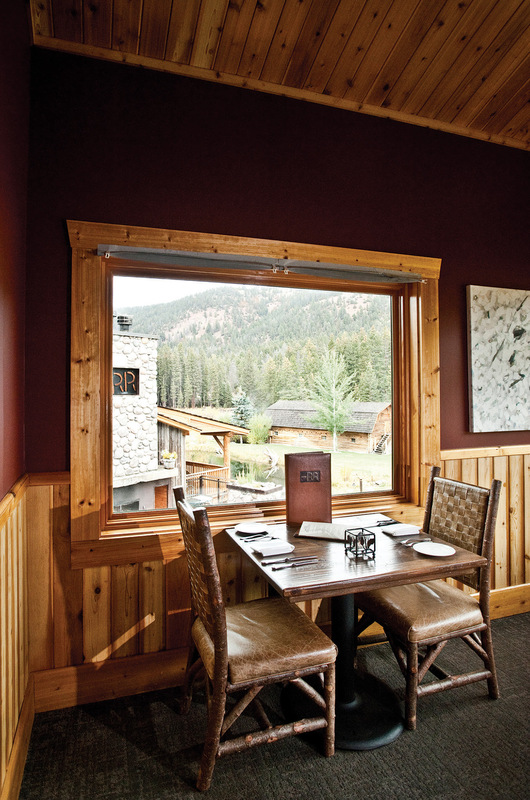 A view of the legendary Gallatin River provides a backdrop to a meal at the Rainbow Ranch Lodge. The front lawn of the Rainbow Ranch Lodge is set back from Highway 191. Dessert first! 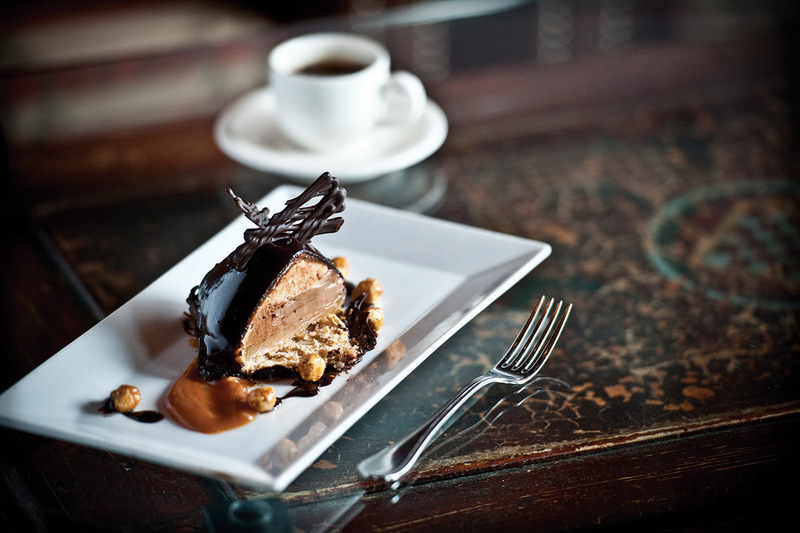 This signature death-by-chocolate dessert is called the “Coeur de Bretagne.” It features both dark chocolate and milk chocolate mousse, layered with hazelnuts and sea salt caramel, enrobed in a chocolate glaze. 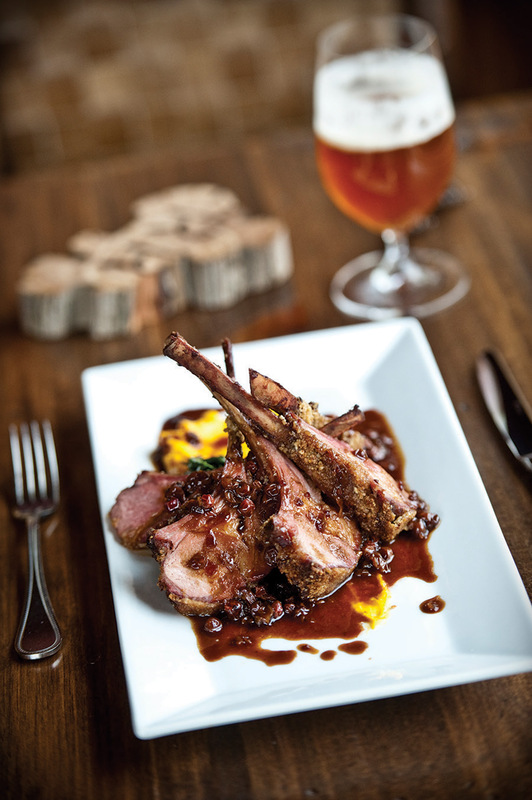 The flavor of an amber ale is Chef Durgan’s preferred balance for his hearty, wildboar entree. 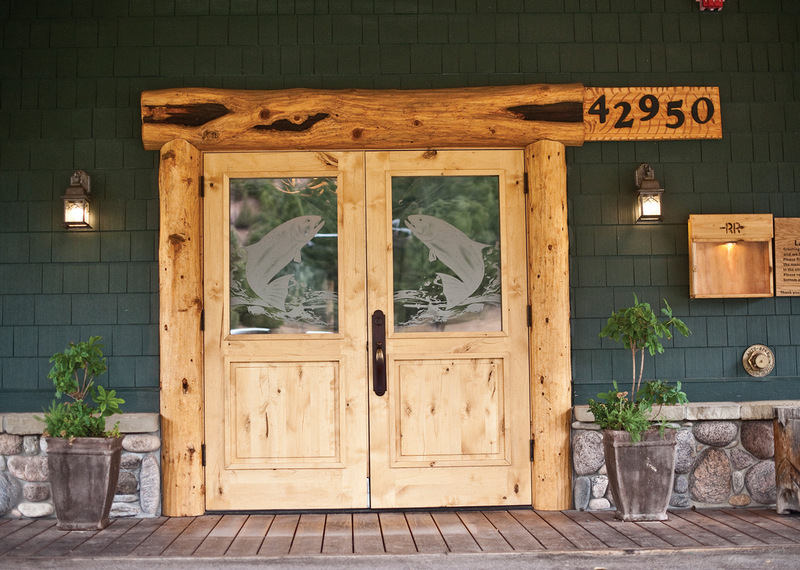 The double doors of the Rainbow Ranch Lodge are etched with two jumping trout. The snowcapped Spanish Peaks are the backdrop for events set on the front lawn.